Anadromous fish migrate from freshwater where they hatch to the ocean where they spend most of their lives and grow large before returning to freshwater to spawn. Common anadromous fish include salmon, smelt, sturgeon, and lamprey. 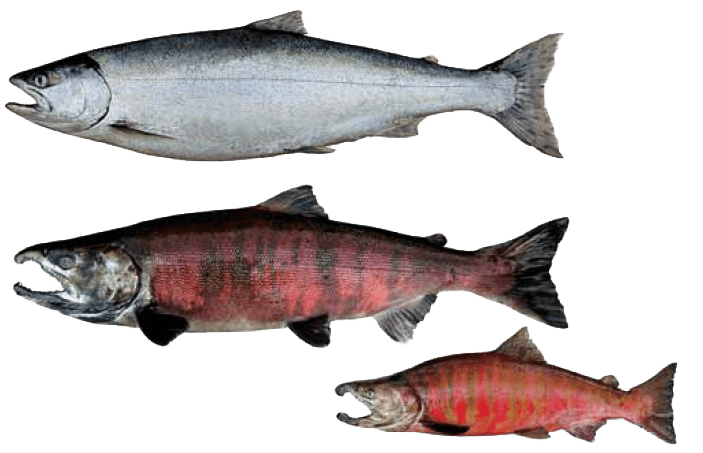 For the purposes of NPAFC, anadromous fish that migrate into the Convention Area and are listed in the Convention Annex include pink, chum, sockeye, coho, Chinook, and cherry salmon and steelhead trout. Pacific salmon are anadromous fish of the genus Oncorhynchus spp. that are hatched in freshwater and spend most of their lives rearing in the ocean before returning to freshwater to spawn. Pacific salmon are semelparous, meaning that after spawning once, all the adults die. 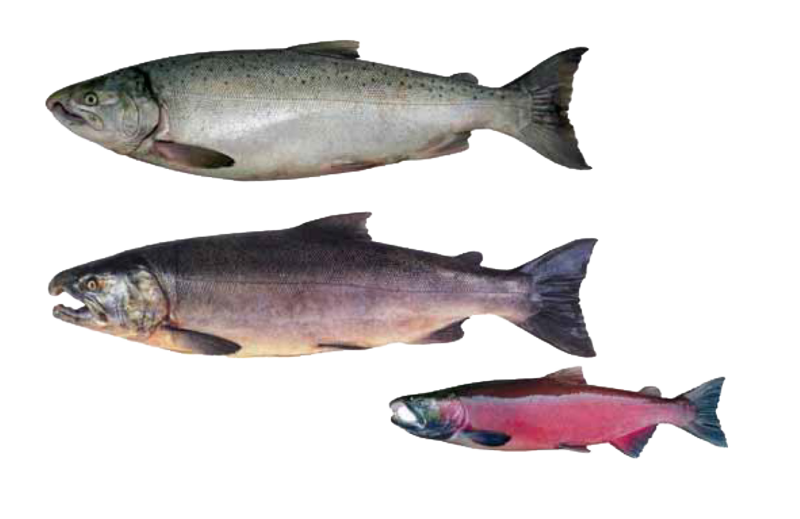 There are six species of Pacific salmon: pink, chum, sockeye, coho, Chinook, and cherry salmon. Steelhead trout are also in the genus Oncorhynchus. A steelhead is the anadromous form of the rainbow trout and can make extensive oceanic migrations in the North Pacific. Unlike Pacific salmon, which are semelparous, steelhead are iteroparous, meaning they can survive spawning and repeat the migration to the ocean and return to freshwater to spawn more than once. Pink salmon are the most abundant species of Pacific salmon and originate both in Asia and North America. Upon emergence, pink salmon fry migrate quickly to the sea and grow rapidly as they make extensive feeding migrations. Pink salmon have a fixed two-year life cycle. After eighteen months in the ocean, maturing fish return to their river of origin to spawn. An odd-year dominance cycle of pink salmon exists in many regions of the North Pacific, meaning that the number of adults returning to freshwater in an odd-numbered year is much higher than the number returning in an even-numbered year. Adults are the smallest Pacific salmon and range from 45–55 cm in length and 1.0–2.5 Kg in weight. Pink salmon die after spawning (semelparous). How to distinguish the ocean phase: Pink salmon have large oval black spots on the back (dorsolaterally) of the body and on both lobes of the tail fin. Scales are very small. A large hump develops on the back of maturing males. The meat is pink, relatively soft, and is relatively low in fat content compared with Chinook and sockeye salmon. Chum salmon are the second most abundant species of Pacific salmon and originate both in Asia and North America. The fish spawn in streams and the fry migrate to the sea soon after emergence from the gravel. Immature chum salmon distribute themselves widely over the North Pacific Ocean, and the maturing adults return to the home streams in summer or autumn at various ages, usually after spending 2 to 5 winters at sea. Adults have been reported up to 108.8 cm in length and 20.8 kg in weight. Chum salmon die after spawning (semelparous). 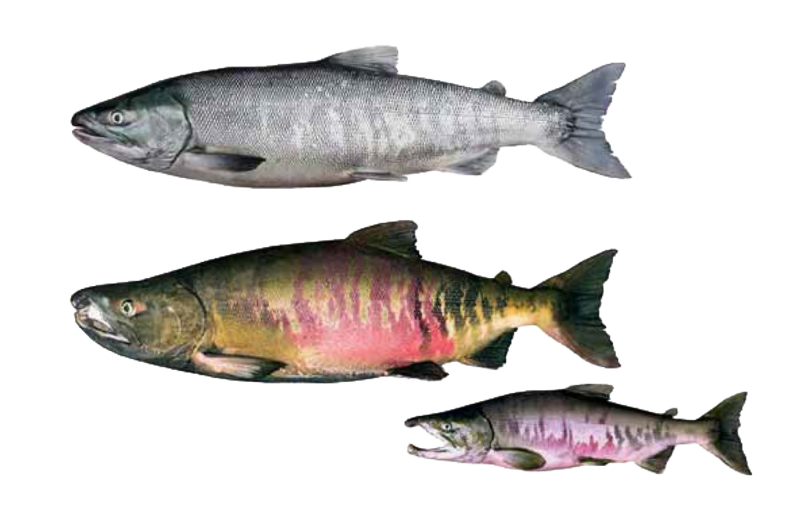 How to distinguish the ocean phase: Chum salmon do not have spots on the body or tail. The tail fin has distinct silver streaks. Compared with other Pacific salmon, the caudal peduncle is relatively narrow and the pupil of the eye is relatively large. The meat is pale pink, slightly firm, and relatively low in fat content compared with Chinook and sockeye salmon. Sockeye salmon are the third most abundant species of Pacific salmon and originate both in Asia and North America. Typically juvenile sockeye salmon utilize lakes for rearing areas for one to three years after emergence from the gravel, but some populations can utilize stream areas for rearing and may migrate to sea soon after emergence. Sockeye salmon spend 1–4 years in the ocean before returning to fresh water to spawn. Body size of adults is variable, but can range 45–60 cm in length and 1.6–3.2 Kg in weight. Sockeye salmon die after spawning (semelparous). 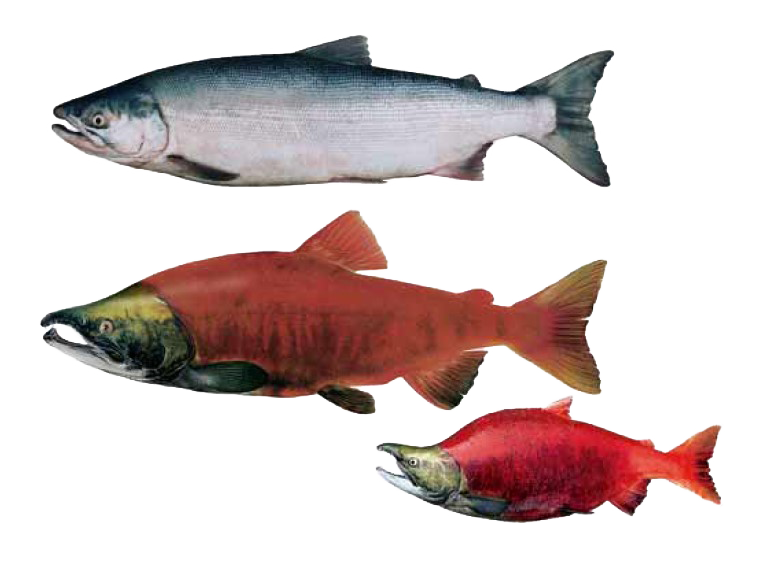 How to distinguish the ocean phase: Sockeye salmon do not have black spots present on the body or tail. Scales are neatly arranged in regular rows on the body. Meat color is bright red, relatively firm, and high in fat content compared to chum and pink salmon. Coho salmon originate both in Asia and North America. Coho salmon fry generally remain in freshwater for one to two years and then migrate to the ocean. After approximately 18 months at sea, the fish return to their freshwater spawning areas. The adult size is variable with lengths ranging from 40–88 cm and weights from 1.2–6.8 kg. Coho salmon die after spawning (semelparous). How to distinguish the ocean phase: Coho salmon have small black spots on the back that may also be present on the upper lobe of the tail. The tail has bright but not well-demarcated silver coloration. The caudal peduncle is relatively broad and the base of the teeth in the lower jaw is white. The meat is pink and firm and can have a drier texture than other Pacific salmon species when cooked. Chinook salmon originate both in Asia and North America. Chinook salmon are not as abundant as chum, pink, and sockeye salmon and can grow to a body size larger than other Pacific salmon. Their life history includes an array of variations. All Chinook salmon die after spawning (semelparous). “Stream-type” Chinook salmon spend one year as fry or parr in fresh water before migrating to the sea. Typically, this type will return to their natal river in the spring or summer several months prior to spawning. “Ocean-type” Chinook salmon migrate to sea during their first year of life, normally within three months after emergence from the river gravel, and return to their natal river in the fall shortly before spawning. The length of adults varies from 58–89 cm, or larger. The typical weight range of the Chinook salmon is 4.5–22.5 kg. How to distinguish the ocean phase: Chinook salmon have small round black spots on the back and both lobes of the tail fin and black color along the base of the teeth in the lower jaw. Meat color is pink, although some Chinook salmon have white meat due to the difference in how they process pigments in the food they consume. The meat is quite firm and has a relatively high fat content compared to chum and pink salmon. Cherry salmon originate only in Asia. Most of them mature at three or four years of age, after spending one or more years in rivers and one winter in the ocean. All anadromous cherry salmon die after spawning (semelparous). They return to the natal river in March–May, spend the summer in the river, and move to headwaters for spawning in the fall. The size of adults varies greatly, generally 50 cm or more in length and 2–2.5 Kg or more in weight. 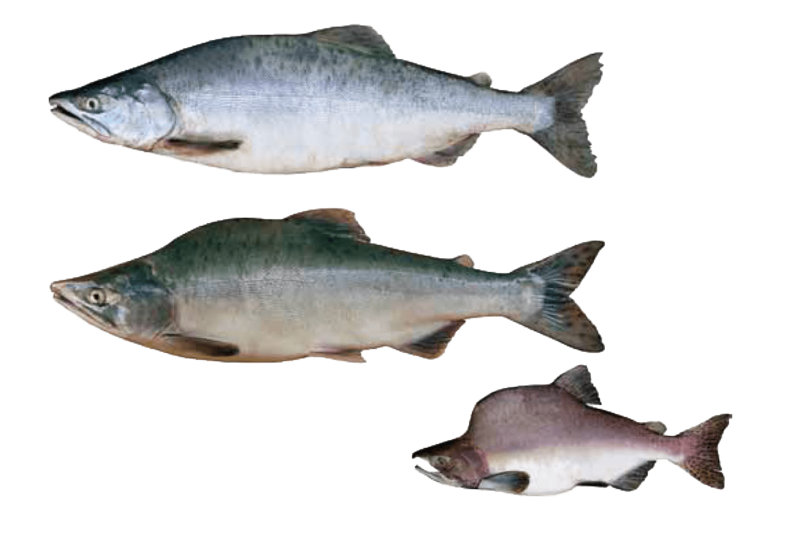 How to distinguish the ocean phase: Cherry salmon most closely resemble coho salmon. Cherry salmon have small black spots on the back and a dark underlying hue under its silvery scales. The meat is bright red and has a firm texture, and it is more moist and fatty than coho salmon. 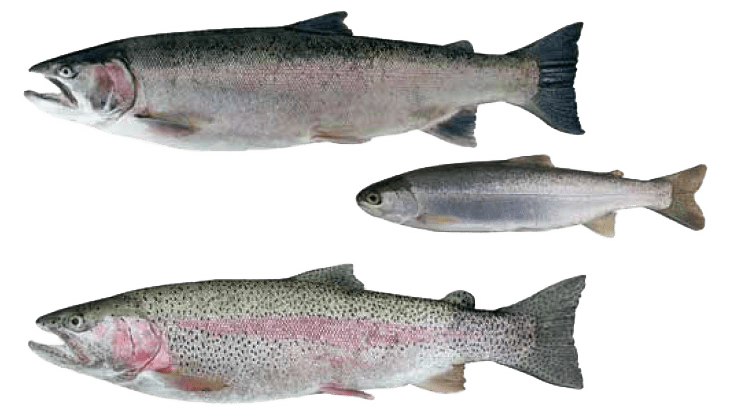 Steelhead trout is the anadromous form of rainbow trout. Steelhead trout originate in both North America and Asia. Most steelhead remain in freshwater for 2–3 years, spend 2–3 years in the ocean, and return to the natal river to spawn. Some steelhead may spawn more than once (iteroparous). Typical sizes of adults range 50–58 cm in length and 1.4–6.8 Kg in weight. 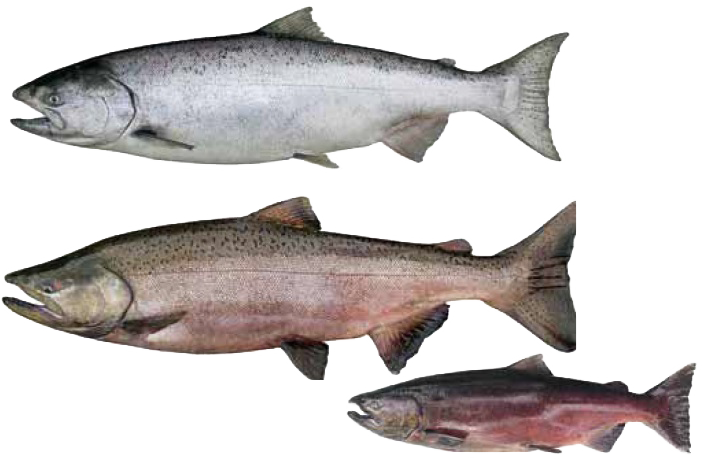 How to distinguish the ocean phase: Steelhead trout have small black spots present on the head, back, and tail fin. Silver marking on the tail is confined to the center area. The head is relatively small and the tail relatively large as compared to Pacific salmon. The tail is not forked. Meat is light pink and the texture is firm. 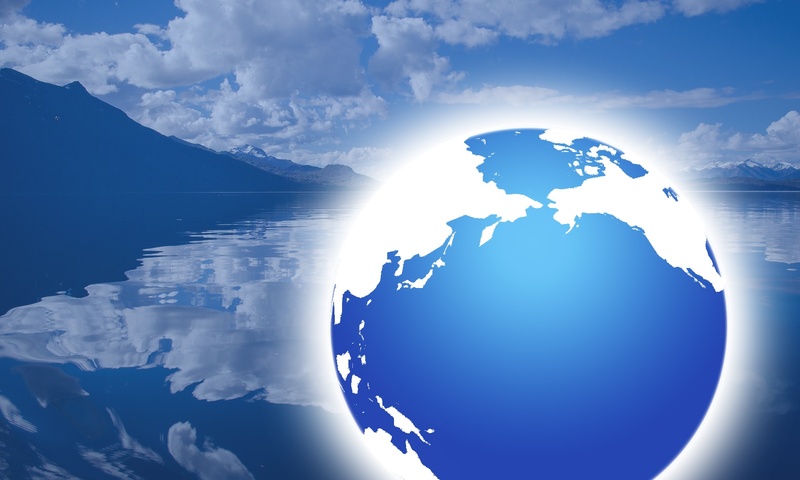 Prior to introductions by humans, Atlantic salmon historical distribution is the North Atlantic, breeding in rivers of Western Europe, Iceland, Greenland, and the East coast of North America. Atlantic salmon is iteroparous, unlike Pacific salmon which is semelparous. Iteroparous means that Atlantic salmon, like steelhead, can survive spawning, return to the ocean, and repeat the migration to freshwater and spawn more than once. Wild Atlantic salmon catch comprise less than 0.1% of farmed Atlantic salmon harvest while wild Pacific salmon catch exceed farmed Pacific salmon production (mostly coho and Chinook) by more than 5 times.